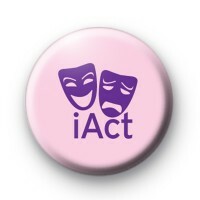 Modern fun Pink and Purple iAct Drama Badge. This pink badge has the iconic theatre happy and sad masks in purple and the text iAct written underneath in the same purple font. The drama masks represent comedy/tragedy on stage and are easily recognisable. Our Drama/Acting badges are perfect for budding stars and any actors and actresses among you. Also ideal for teachers to use as keepsakes for their Drama students after a school play or performance. All our badges are handmade in the UK and 1-inch in size.